If I had to pick one bergenia, this lofty Himalayan would be it. Of course, it helps that I saw it by the mile throughout the Pakistan Himalayan on my fateful visit (we flew into Pakistan on 9-11-2001). This and Polygonum (or is it Persicaria?) affine were the only two plants that seemed to thrive above treeline: both making immense carpets of colorful foliage in autumn. The grazing pressure was unbelievable, and I suspect these two plants were unpalatable to the myriad goats and sheep. It would have been fun to see these in bloom--probably in May or June: something I am not apt to do in nature, I'm afraid...but that's why we have gardens! 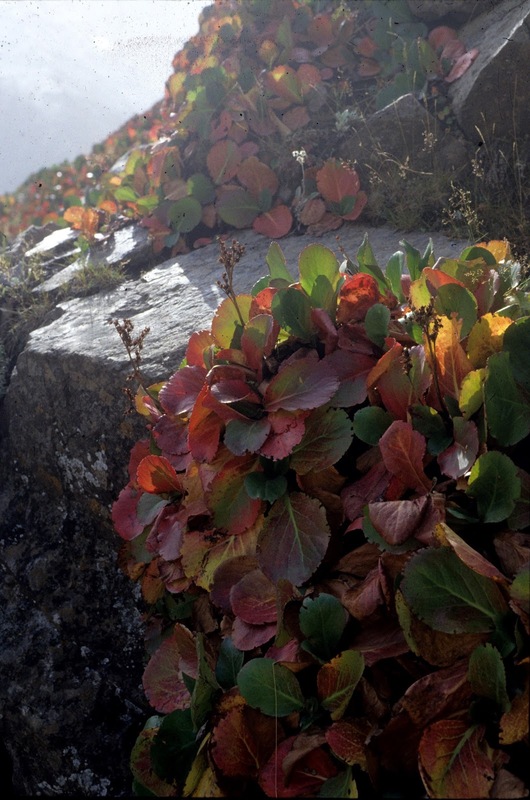 Speaking of gardens,here Bergenia stracheyi is coloring up nicely in my own rock garden at home. Here is the clump in Eric's garden (I scanned the transparency I took 34 years ago)...This clone is half the size or less of most garden Bergenia: much better in rock gardens because of this! And here's the clump in my home garden--the flowers take on a pink blush as they age. 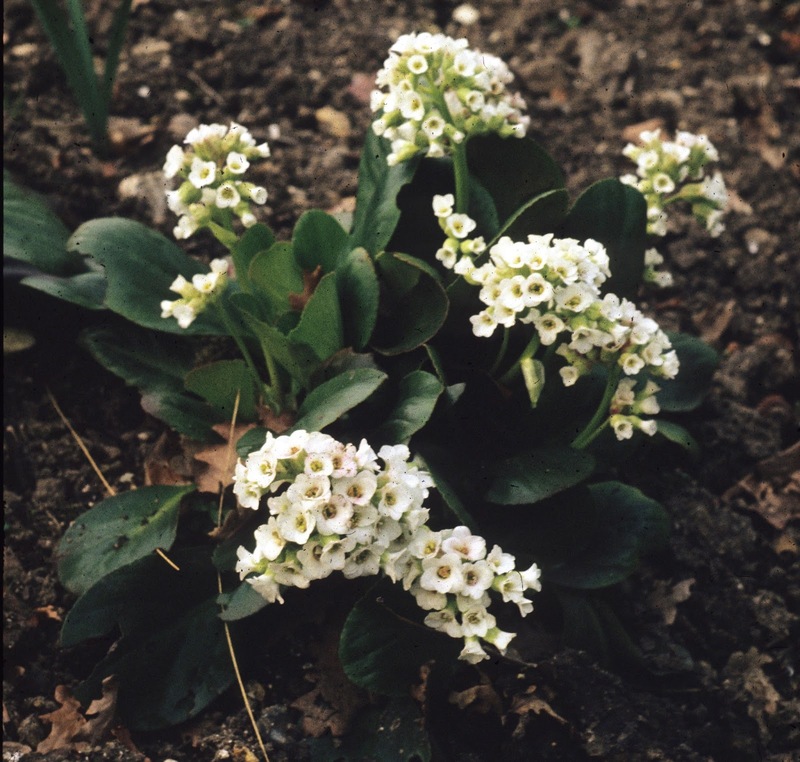 I took this picture at the wonderful scree garden at Savill gardens, also in 1981- undoubtedly the same clone. For years it grew with uncommon vigor in the Rock Alpine Garden in Denver--it's slowed down a bit perhaps since I took this picture some twenty years ago...which is why we take pictures after all! The same colony a few weeks later, as the flowers take on blush tints. Just looking at this gives me a great nostalgia for high spring, for the Himalaya, for the wonderful way that plants and rocks combine in rock gardens! The first real snowstorm of the winter is predicted tonight--but this could nevertheless be poking up its first flowers in four months! A small eternity of winter when there's time to dream and reminisce! My dear Mr. P ~ I am terribly remiss about stopping over here to write a comment for I tend to read your blog (always!) in a reader & therefore don't visit 'in person.' But tonight I had to click over because dare I say, I have NEVER read a post anywhere about Bergenias and I do so love them! These photos are divine and you have even taken me down memory lane with your Savill Garden shot because in the late 80's myself & the Mister were living basically right next door .... I tromped thru that garden endlessly. 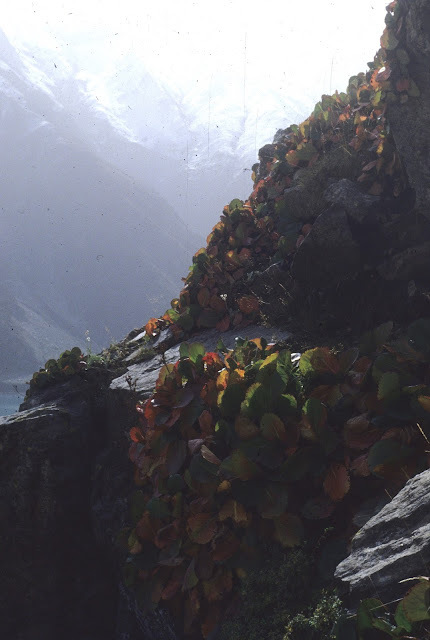 Anyhoo, I shall never get to the Himalayas so am living vicariously ;>)) I'm especially intrigued about that Polygonum/Persicaria for that's the family that indigo dye comes from and as I'm learning, most things in that family give up some sort of color on cloth. I could blither on endlessly but I'll spare you. That you for your sweet note, Christi: I envy you your sojourn next to Savill: I think one of the most enchanting and amazing times I've ever had anywhere was at that garden in late April walking through endless acres of tiny daffodils (each species with its own meadow) in the golden afternoon light--with almost no one else there. Heaven must be like that! (Otherwise, I'll be content in the other place...). Excellent … as always. Many thanks. I have a small clump of this dwarf Bergenia in my garden in England. 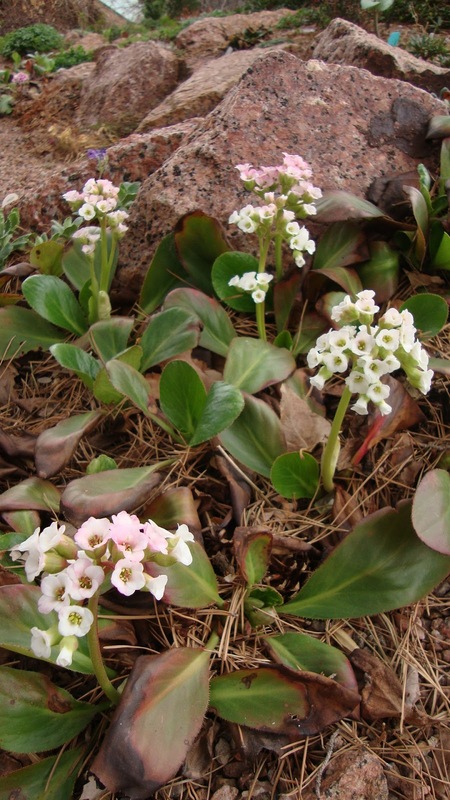 For years I tried to find out its name - google searching: miniature bergenia, dwarf bergenia ect. without success! 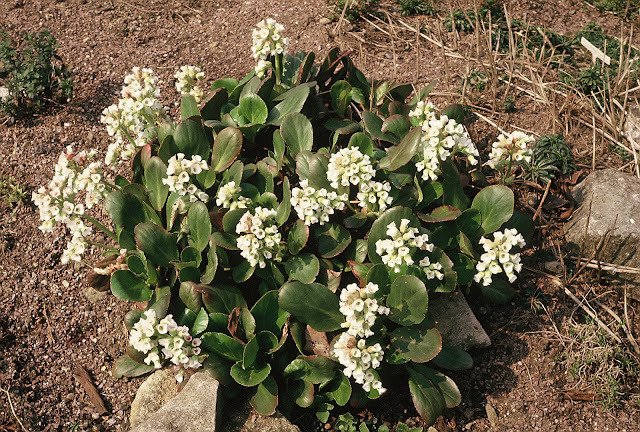 Then just last week, I found its picture in the latest issue of an English gardening magazine and they call it Bergenia stracheyi! At long last! Mine has white flowers and spreads very slowly. 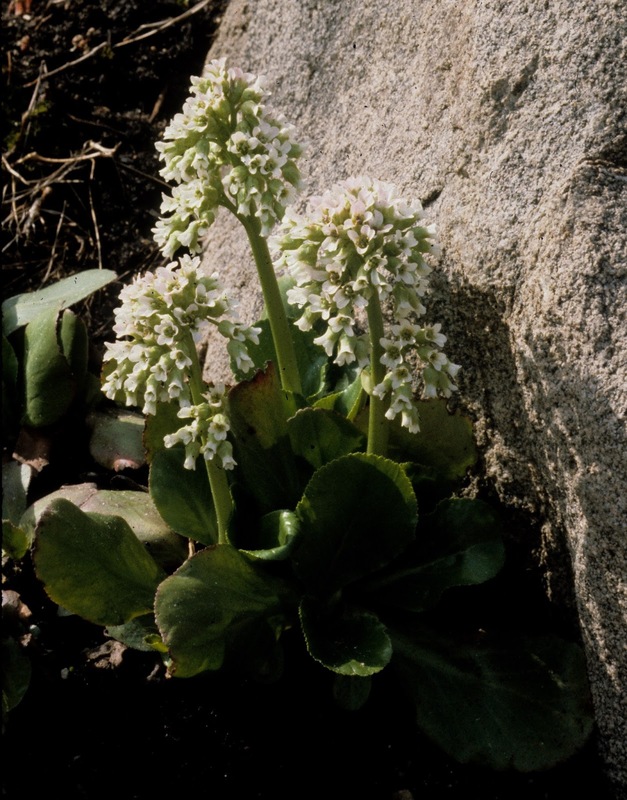 Maybe it's because it is planted in flat damp ground and not in a stoney rockery where it would be happier. You rarely see this dwarf Bergenia for sale in garden centres. Like the white Forsythia, or the yellow Budhlia 'Harleqin' ; very rare, always see Budhlia plants with flowers of boring blue shades in garden centres. Don't know why! Don't they want to make money?! Or maybe they garden centres don't know much about plants?! It sounds as though you have the same plant I obtained nearly 40 years ago from Eric Hilton, near Bristol: it grows much faster if pampered! Mine at home on a hungry crevice is likewise pokey. Garden centres alas sell pretty much what wholesalers provide them and nowadays that's mostly named clones that are proprietary. Many of the plants are free trade: no one makes money on them so no one wants them (since anyone can grow them). If a plant is proprietary--they have a monopoly on it (so to speak). I think that explains the quandary we find more and more in a mass market anywhere. I meant Buddleja ""Sungold" or "Sunglow" maybe the same plant but with different names. It has beautiful scented yellow flowers and not the common Buddleja with flowers of boring blue purple shades. I also want garden centers start to sell Forsythia with beautiful white flushed pink flowers and not the bloody common Forsythia with boring yellow flowers. They should also start to sell the really hardy Bitter Japanese Orange Tree that can grows outside all year round, can be planted as a hedge. It has small leaves, lots of scented white flowers and lots of small scented orange fruits about toe size and long sharp thorns to keep intruders out. Normal citrus trees will not grow outdoors (or even indoors!) in England. But no garden centers sell this bitter Japanese orange trees in England. The Dutch only use its cold hardy rootstock to grab normal citrus trees on it.